Traffic diversions are in place as fire crews deal with a fire at Amarone. Fire: Crews battle with a blaze on Union Street. Firefighters are dealing with a fire at a restaurant in Aberdeen. 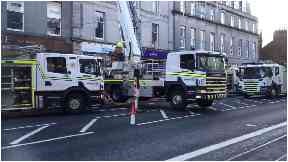 Police and fire services were alerted to the blaze at Amarone on Union Street at around 10.30am. A Scottish Fire and Rescue Service spokeswoman confirmed two appliances had been sent to the scene. Langstane Place has been closed along with part of Union Street while the fire crews are in attendance. Police confirmed that traffic diversions are in place across the street.